Bianca Sforza attracted few stares when introduced to the art world on January 30, 1998. She was just a pretty face in a frame to the crowd at a Christie's auction in New York City. Nobody knew her name at the time, or the name of the artist who had made the portrait. The catalog listed the work—a colored chalk-and-ink drawing on vellum—as early 19th century and German, with borrowed Renaissance styling. A New York dealer, Kate Ganz, purchased the picture for $21,850. The price hadn't budged almost ten years later when a Canadian collector, Peter Silverman, saw Bianca's profile in Ganz's gallery and promptly bought it. The drawing might actually date from the Renaissance, he thought. Ganz herself had mentioned Leonardo da Vinci, that magical name, as an influence on the artist. Silverman came to wonder, What if this is the work of the great Leonardo himself? That someone could walk into a gallery and buy a drawing that turns out to be a previously unknown Leonardo masterpiece, worth perhaps $100 million, seems pure urban myth. Discovery of a Leonardo is truly rare. At the time of Silverman's purchase, it had been more than 75 years since the last authentication of one of the master's paintings. There was no record that the creator of the "Mona Lisa" ever made a major work on vellum, no known copies, no preparatory drawings. If this image was an authentic Leonardo, where had it been hiding for 500 years? Silverman emailed a digital image of Bianca to Martin Kemp. Emeritus professor of art history at Oxford University and a renowned Leonardo scholar, Kemp regularly receives images, sometimes two a week, from people he calls "Leonardo loonies," convinced they have discovered a new work. "My reflex is to say, No!" Kemp told me. But the "uncanny vitality" in the young woman's face made him want a closer look. He flew to Zurich, where Silverman kept the drawing in a vault. At 13 by 9¾ inches, it is roughly the size of a legal pad. "When I saw it," Kemp said, "I experienced a kind of frisson, a feeling that this is not normal." That initial shiver of excitement compelled Kemp to embark on his own investigation. He was aided by high-resolution multispectral scans by Pascal Cotte of Lumiere Technology in Paris, allowing Kemp to study the drawing's layers, from first strokes to later restorations. The more Kemp looked with his connoisseur's eye, the more he saw what he considered evidence of Leonardo's hand—how the hair bunched beneath the strings holding it in place, the beautiful modulation of colors, the precise lines. Shaded areas showed distinctive left-handed strokes just like Leonardo's. The expression, poised but pensive, the look of someone growing up too fast, conveyed Leonardo's maxim that a portrait should reveal "motion of the mind." Kemp also needed proof that the portrait had been made during Leonardo's lifetime (1452-1519) and that its historical particulars fit the artist's biography. The vellum, probably calfskin, had been carbon-dated, its origin placed somewhere between 1440 and 1650. Costume research revealed that the sitter belonged specifically to the Milanese court of the 1490s, with its fashion for elaborately bound hair. 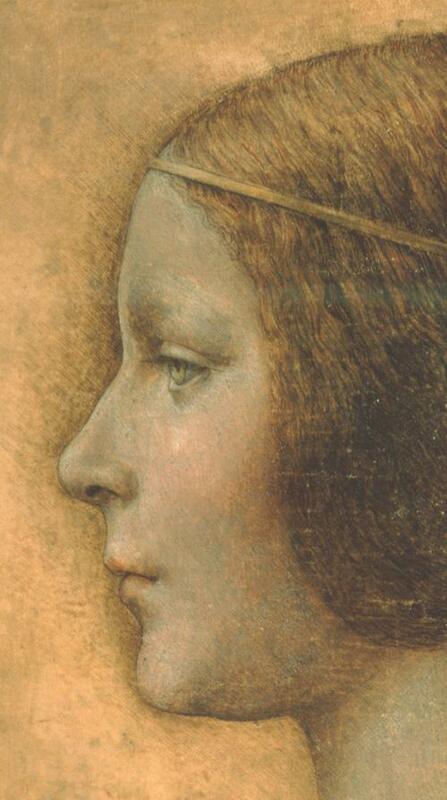 Leonardo lived in Milan during this time, accepting commissions for court portraits. Stitch marks on the edge of the portrait suggested that it came from a book, possibly one commemorating a royal marriage. Kemp's detective work led him to a name, Bianca Sforza. An illegitimate daughter of the Duke of Milan, she was married in 1496 to Galeazzo Sanseverino, commander of the Milanese troops and a patron of Leonardo's. Bianca was 13 or 14 at the time of the portrait. Tragically, she died a few months later, likely from an ectopic pregnancy, a not uncommon fate for young court brides. Kemp named the drawing "La Bella Principessa," the beautiful princess. In 2010 Kemp and Cotte published their findings in a book. Several prominent Leonardo scholars agreed, others were skeptical. Carmen Bambach, curator of drawings at New York's Metropolitan Museum of Art, was quoted as saying that the portrait simply "does not look like a Leonardo." Another scholar thought the image too "sweet." The specter of a high-quality forgery was raised. Doubt seemed to collect around the portrait's sudden, almost miraculous appearance. Where had it come from? Kemp didn't know. Then, almost like divine intervention, a message came from D. R. Edward Wright, emeritus professor of art history at the University of South Florida. Having followed the very public dispute, Wright suggested to Kemp, whom he had never met, that his answer might lie in the National Library of Poland in Warsaw, inside a book called the Sforziad. Wright, an expert on Renaissance iconography, described it as a deluxe commemorative volume for the marriage of Bianca Sforza, a fit occasion for a Leonardo portrait. Funded by a National Geographic Society grant, Kemp and Cotte traveled to Warsaw. Cotte's macrophotography revealed that a folio had been removed from the exact place in the Sforziad where a portrait would have been added. The moment arrived when they inserted a copy of Bianca's portrait into the open book. It fit perfectly. For Kemp, this was the clincher: " ‘La Bella Principessa' was a one-off portrait by Leonardo that had gone into a book and then onto a shelf." According to Wright, the volume reached Poland in the early 1500s, when a member of the Sforza family married a Polish royal. The leaf was sliced out, possibly at the time of the book's rebinding in the 17th or 18th century. The trail grows faint here. What is known is that at some point it was acquired by an Italian art restorer, whose widow put it up for sale at Christie's. These are amazing times in the lost-Leonardo arena. In November the National Gallery in London put on exhibit "Salvator Mundi," Leonardo's painting of Jesus Christ holding a globe, a work that had been lost for centuries. In Florence, National Geographic—supported researchers looking for Leonardo's "Battle of Anghiari," last seen in the mid-1500s, are using an endoscope to find out if the painting is hidden behind a wall in the Palazzo Vecchio. Authenticating a centuries-old artwork, especially a potentially rare, extremely valuable Leonardo, is seldom a clear-cut, objective process. Ego, personal taste, and fear of litigation all get tangled up in the judgment. To reach wider consensus, Kemp sent his latest findings to a number of leading specialists. Almost all refused comment, including for this article. Agreement "will take time," concedes Kemp, "but I have clear confidence in where I am." One thing is sure. Should the day come when Bianca Sforza's face hangs in a museum as a true Leonardo, everyone will stare.